ebelskiver, how do i love thee? let me count the ways: sausage, peanut butter, nutella, cinnamon bun…. 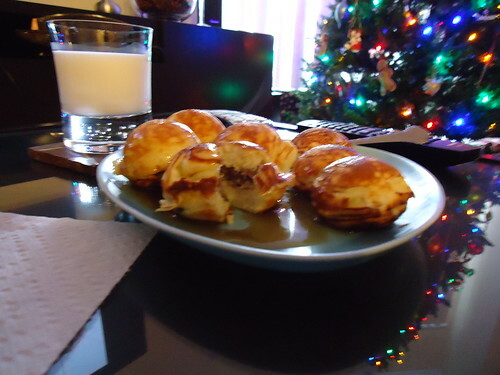 bran gave me an ebelskiver pan for Christmas this year. 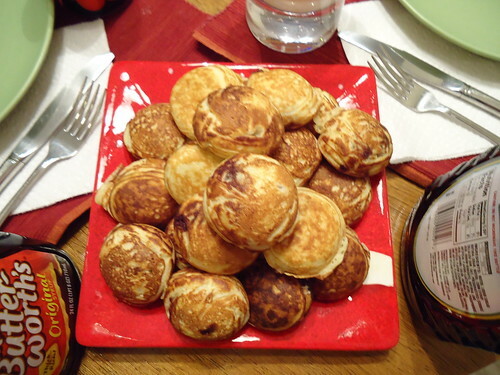 ebelskiver is basically a filled pancake. what you decide to fill it with is what really makes it great. you can go the hearty route, with sausage, eggs, bacon… or you can go the sweet route with pb, nutella, or cinnamon. there is no wrong way to fill an ebelskiver. williams-sonoma’s website has 20 different ebelskiver recipes, and i plan on trying all of them. their cinnamon bun ebelskiver recipe is included below. prepare any fillings, as needed. for cinnamon filling: in a bowl, sift together granulated sugar, flour, cinnamon and salt. add the butter, and using back of a spoon, mash the butter into the flour mixture until all of it is absorbed into the batter, forming a paste. set aside. 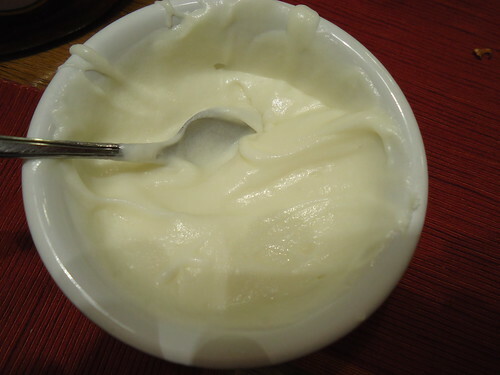 for the cream cheese frosting: in a bowl, beat together cream cheese and butter on medium speed until light and fluffy, 2-3 min. add the confectioners’ sugar, reduce the speed to low and beat until combined, 1-2 min., stopping occasionally to scrape down the sides of the bowl. add 3 tbsp of milk and beat until combined, about 1 min. the frosting should be thick, add more milk if desired to thin it. transfer to small bowl, place in the fridge. for the sausage patty filling: form breakfast sausage into mini-patties, 1 – 1 1/2″ in diameter. brown on both sides, place on a paper-towel lined plate to drain excess grease. set aside. in a bowl, whisk together the flour, baking powder, salt and granulated sugar. in another bowl, lightly whisk the egg yolks, then whisk in the milk and the 4 tbsp melted butter. whisk the egg yolk mixture into the flour mixture until well combined; the batter will be lumpy. pre-heat ebelskiver pan to medium-low heat. using an electric mixture, fitted with a whisk attachment, beat the egg whites on high speed until stiff, but not until dry peaks form, 2-3 min. using a whisk, gently fold the whites into the batter in two additions. spray ebelskiver pan with pam. spoon 1 tbsp batter into each well. 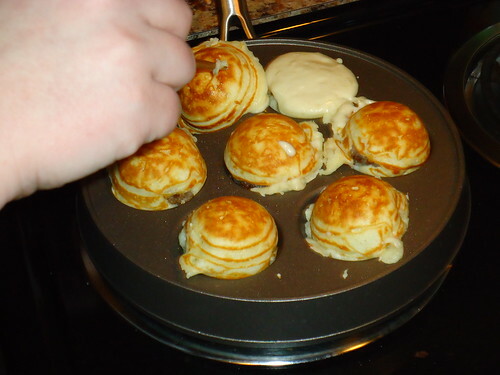 spoon 1 tsp filling (or sausage patty) into the center of each pancake and top with 1 tbsp batter. cook until the bottoms are golden brown and crispy. using wooden chopsticks, flip the pancakes over and cook until golden and crispy. repeat with remaining batter and filling. serve with syrups, powdered sugar or frosting. Omg – my favorite breakfast by far!